Welcome to another dose of daily tech news, courtesy of our friends at TechRadar. Today we've got something to interest everyone – new smartphones, new smartwatches, new laptops (some with Alexa built in), and the latest news from Nvidia's robotics researchers. Is this the HTC U12 Plus? HTC is readying its next flagship phone and we're expecting it to break cover tomorrow. In the meantime, someone obviously didn't get the launch date memo, and pushed out an update to the HTC website that listed the phone's specs: a 6-inch 1440 x 2880 screen, a Snapdragon 845 chipset, 6GB of RAM, 128GB of storage and a 3,500mAh battery. Based on the price listed (which was for China), this is likely to be an expensive handset as well. 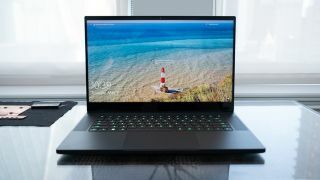 If you're in the market for a gaming laptop then the Razer Blade is likely to be somewhere near the top of the list, and the computer just got its first redesign in five years. The new and improved version ups the screen size to 15.6 inches but reduces the overall size thanks to some super-thin bezels, while there's a redesigned chassis and a choice of top-end processors from Intel's latest batch. Prices for the new models start at £1699 or $1,899. 3. Will the next Galaxy watch run Wear OS? This could be a real shot in the arm (or rather wrist) for Google's Wear OS smartwatch platform: apparently Samsung's next Galaxy wearable will run Google's software rather than Samsung's own Tizen OS. That's according to a semi-reliable tipster online, and while it would be a surprise, it's possible that Google has managed to twist Samsung's arm. The next Galaxy smartwatch should appear at the end of August at the IFA 2018 trade show. We're seeing Amazon's Alexa digital assistant make its way to a growing number of devices outside of the Echo line, and Acer is the latest hardware maker to embrace Alexa. The AI-powered app is going to show up on the Spin 3 and Spin 5 laptops from the end of May, and will have all the capabilities of Alexa on the Amazon Echo too. Prices for the Spin 3 start at £549/$499 (about AU$659), while the Spin 5 will set you back £799/$699 (AU$999). Finally, the latest news from the robot revolution. Researchers at Nvidia have developed a way for robots to learn by watching human beings in action – neural networks can be trained on video feeds and pick up how to do something, which is much quicker than coding all those instructions in manually. Click through on the link below to see a video of how the process works, step-by-step, but let's just hope the robots don't get too smart.